· Prof. Sidiropoulos was appointed Louis T. Rader Professor, effective 8/25/2018. Lou Rader had a trailblazing career in industry and academia, including as VP and General Manager of the Communications and Controls Division at GE, President of the Univac Division at Sperry Rand, and Chair of the ECE Department at UVA (1969-1974). He was a Fellow of IEEE and a member of NAE. · Mohamed Salah Ibrahim’s paper Mirror-Prox SCA Algorithm for Multicast Beamforming and Antenna Selection was chosen as one of six best student paper finalists at IEEE SPAWC 2018. The paper was co-authored with Dr. Aritra Konar, a graduate of (and now postdoctoral researcher in) our group. · Group alumnus Kejun Huang joined the Computer and Information Science and Engineering Department at the University of Florida, Gainesville. Congratulations Kejun! – well-deserved! · Ahmed S. Zamzam has been awarded the UMN Doctoral Dissertation Fellowship (DDF) for 2018/2019. The DDF program gives the University's most accomplished Ph.D. candidates an opportunity to devote full-time effort to dissertation research and writing during the fellowship year. Congratulations Ahmed! · Aritra Konar defended his Ph.D. in Sept. 2017, and moved to the University of Virginia as a postdoctoral research associate. Congratulations Aritra! · Group alumnus Xiao Fu joined Oregon State University as Assistant Professor in the Electrical Engineering and Computer Science Department, in Aug. 2017. Xiao recently won his first NSF grant as PI – well-deserved congratulations! · In 2017, Google Scholar released its Classic Papers: Articles That Have Stood the Test of Time. Our paper Transmit Beamforming for Physical Layer Multicasting published in 2006 is one of those classic papers, in the top-10 in the Signal Processing category. · Our paper Tensor Decomposition for Signal Processing and Machine Learning has been in the top-100 IEEE-wide downloads every month since July 2017, with over 13,000 downloads as of October 2018. IEEE is the largest professional organization in the world, with 400,000 members. As of early 2018, IEEExplore holds over 4 million published articles. 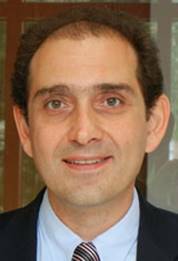 · Nikos Sidiropoulos has been appointed Vice President of the IEEE Signal Processing Society (2017-2019). He is responsible for membership services, development, and the overall member experience. · Nov. 2016: Check out this three-minute video trailer of our NIPS paper ‘‘Anchor-Free Correlated Topic Modeling: Identifiability and Algorithm’’. You can also try our Matlab demo. · Oct. 2016: Xiao Fu was recognized as the ‘‘Outstanding Postdoctoral Scholar’’ by the Postdoctoral Association and faculty judges of the University of Minnesota. Congratulations Xiao! · Kejun Huang defended his Ph.D. in May 2016, and continues as a postdoctoral researcher in our group. Congratulations Kejun! · Aritra Konar has been awarded the UMN Doctoral Dissertation Fellowship (DDF) for 2016/2017. The DDF program gives the University's most accomplished Ph.D. candidates an opportunity to devote full-time effort to dissertation research and writing during the fellowship year. Congratulations Aritra! · Bo Yang won a Best Student Paper Award (second prize) at the 6th IEEE Workshop on Computational Advances in Sensor Array Processing (CAMSAP 2015) http://inspire.rutgers.edu/camsap2015/ for the paper "Joint Factor Analysis and Latent Clustering", co-authored with Xiao Fu and N.D. Sidiropoulos. The 3 awards were selected from 12 finalists, which were picked from 134 accepted papers based on highest review scores and eligibility (first author is a student). The final selection process included student presentations in a special poster session before the conference and judging by a panel of senior experts. · Balasubramanian Gopalakrishnan defended his Ph.D. in May 2015, and joined Qualcomm San Jose, as member of technical staff. Congratulations Bala! Kejun Huang wins prestigious UM Informatics Institute fellowship – congratulations Kejun! Prof. Sidiropoulos delivered the inaugural plenary lecture at EUSIPCO, Sep. 2, 2014, Lisbon, Portugal, entitled “Tensor Decomposition Theory and Algorithms in the Era of Big Data''. EUSIPCO is the flagship conference of the European Association for Signal Processing (EURASIP). Prof. Sidiropoulos delivered a plenary lecture at ISWCS, Aug. 28, 2014, Barcelona, Spain, entitled “Frugal Sensing and Estimation over Wireless Networks''. Xiao Fu and John Tranter co-authored a paper that received a Best Student Paper Award (third prize) at IEEE ICASSP 2014 in Florence, Italy. Congratulations Xiao and John! Xiao Fu and John Tranter co-authored a paper that was voted best student paper in the sensor array and multichannel signal processing category at IEEE ICASSP 2014 in Florence, Italy. The paper is a candidate for a conference-wide Best Student Paper Award. Congratulations Xiao and John! Omar Mehanna finished his Ph.D. and joined Qualcomm in May! - congratulations and best wishes for a stellar career and a great journey in life Omar! Prof. Sidiropoulos was elected Fellow of the European Association for Signal Processing (EURASIP), for contributions to tensor decomposition and signal processing for communications (2014). · Omar Mehanna has been awarded the UMN Doctoral Dissertation Fellowship (DDF) for 2013/2014. The DDF program gives the University's most accomplished Ph.D. candidates an opportunity to devote full-time effort to dissertation research and writing during the fellowship year. · The 2013 Distinguished Alumni Award, Dept. ECE, University of Maryland, College Park. o Collaborative Research: Multimodal Sensing and Analytics at Scale: Algorithms and Applications, NSF ECCS-1807660, N.D. Sidiropoulos (collaborative project with X. Fu, Oregon State University). o Identifying Potential Investors using Joint Factorization and Latent Clustering, Corning, PI: N.D. Sidiropoulos; Co-PI: K. Huang. o III: Medium: High-Performance Factorization Tools for Constrained and Hidden Tensor Models, NSF IIS-1704074, PI: G. Karypis, co-PI: N.D. Sidiropoulos. o Oct. 2016: Received gift funding from Huawei Inc. to support our group’s 5G wireless research. o Robust and Scalable Volume Minimization-based Matrix Factorization for Sensing and Clustering, NSF ECCS-1608961, PI: N.D. Sidiropoulos; Co-PI: X. Fu. o CIF: Small: Feasible Point Pursuit for Non-convex QCQPs: Algorithms and Signal Processing Applications, NSF CIF-1525194, PI: N.D. Sidiropoulos. This is a collaborative project with SUNY-Buffalo (K. Slavakis). o BIGDATA: IA: DKA: Collaborative Research: Learning Data Analytics: Providing Actionable Insights to Increase College Student Success, NSF IIS-1447788, PI: G. Karypis, co-PI: N.D. Sidiropoulos. This is a collaborative project with GMU. o Wideband cognitive sensing from a few bits, NSF ECCS-1231504, PI: N.D. Sidiropoulos. o EARS: Spectral Tweets: A Community Paradigm for Spatio-temporal Cognitive Sensing and Access, NSF AST-1247885, PI: N.D. Sidiropoulos, co-PIs: G.B. Giannakis, and J.D. Haupt. o BIGDATA: Mid-Scale: DA: Collaborative Research: Big Tensor Mining: Theory, Scalable Algorithms and Applications, NSF IIS-1247632, PI: N.D. Sidiropoulos, co-PI: G. Karypis. This is a collaborative project with CMU (PI: C. Faloutsos, co-PI: T. Mitchell, NSF IIS-1247489). N.D. Sidiropoulos and F. Gini (Section Eds. ), S. Theodoridis, R. Chellapa (Series Eds. 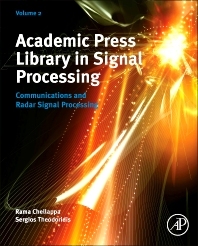 ), Academic Press Library in Signal Processing: Volume 2, Communications and Radar Signal Processing, Academic Press, 2013. In memory of my good friend Alex B. Gershman (1962-2011) see also here. Dr. Sidiropoulos’ research interests are in signal processing for communications, convex optimization, cross-layer resource allocation for wireless networks, and multiway analysis - i.e., linear algebra for data arrays indexed by three or more variables. His current research focuses primarily on signal and tensor analytics, with applications in cognitive radio, big data, and preference measurement. As a sidekick, he is developing optimization algorithms for conference review and session assignment. (135) B. Yang, A.S. Zamzam, and N.D. Sidiropoulos, ``Large Scale Tensor Factorization via Parallel Sketches," IEEE Trans. on Signal Processing, submitted Oct. 17, 2018. (134) A.S. Zamzam, X. Fu, and N.D. Sidiropoulos, ``Data-Driven Learning-Based Optimization for Distribution System State Estimation," IEEE Trans. on Power Systems, submitted Sept. 24, 2018. (133) V. Ioannidis, A.S. Zamzam, G.B. Giannakis, and N.D. Sidiropoulos, ``Coupled Graphs and Tensor Factorization for Recommender Systems and Community Detection," IEEE Trans. on Knowledge and Data Engineering, submitted Sept. 21, 2018. (132) C. Qian, X. Fu, N.D. Sidiropoulos, and Y. Yang, ``Tensor-Based Channel Estimation for Dual-Polarized Massive MIMO Systems," IEEE Trans. on Signal Processing, to appear, 2018. (131) C. Kanatsoulis, X. Fu, N.D. Sidiropoulos, and W.-K. Ma, ``Hyperspectral Super-resolution: A Coupled Tensor Factorization Approach," IEEE Trans. on Signal Processing, to appear, 2018. (130) X. Fu, K. Huang, N.D. Sidiropoulos, and W.-K. Ma, ``Nonnegative Matrix Factorization for Signal and Data Analytics: Identifiability, Algorithms, and Applications," IEEE Signal Processing Magazine, to appear, 2018. (129) C. Kanatsoulis, X. Fu, N.D. Sidiropoulos, and M. Hong, ``Structured SUMCOR Multiview Canonical Correlation Analysis for Large-Scale Data," IEEE Trans. on Signal Processing, to appear. (126) A. Konar, and N.D. Sidiropoulos, ``A Simple and Effective Approach for Transmit Antenna Selection in Multi-user Massive MIMO Leveraging Submodularity," IEEE Trans. on Signal Processing, vol. 66, no. 18, pp. 4869-4883, 2018. (125) X. Fu, K. Huang, and N.D. Sidiropoulos, ``On identifiability of nonnegative matrix Factorization," IEEE Signal Processing Letters, vol. 25, no. 3, pp. 328--332, March 2018. (123) T. Qiu, X. Fu, N.D. Sidiropoulos, and D. Palomar, ``MISO Channel Estimation and Tracking from Received Signal Strength Feedback," IEEE Trans. on Signal Processing, vol. 66, no. 7, pp. 1691--1704, April 1, 2018. (121) X. Fu, K. Huang, E.E. Papalexakis, H.-A. Song, P. Talukdar, N.D. Sidiropoulos, Christos Faloutsos, and Tom Mitchell, ``Efficient and Distributed Generalized Canonical Correlation Analysis for Big Multiview Data," IEEE Trans. on Knowledge and Data Engineering, to appear, 2018. (120) G. Wang, A.S. Zamzam, G.B. Giannakis, and N.D. Sidiropoulos, ``Power System State Estimation via Feasible Point Pursuit: Algorithms and Cramer-Rao Bound," IEEE Trans. on Signal Processing, vol. 66, no. 6, pp. 1649-1658, Mar. 2018. (118) A. Konar and N.D. Sidiropoulos, ``First-Order Methods for Fast Feasibility Pursuit of Non-convex QCQPs," IEEE Trans. on Signal Processing, vol. 65, no. 22, pp. 5927--5941, Nov.15, 15 2017. (116) X. Fu, K. Huang, M. Hong, N.D. Sidiropoulos, and A.M.-C. So, “Scalable and Flexible Multiview MAX-VAR Canonical Correlation Analysis,” IEEE Trans. on Signal Processing, vol. 65, no. 16, pp. 4150-4165, Aug. 15, 2017. (114) A.S. Zamzam, N.D. Sidiropoulos, and E. Dall’Anese, “Beyond Relaxation and Newton-Raphson: Solving AC OPF for Multi-phase Systems with Renewables,” IEEE Trans. on Smart Grid, vol. 9, no. 5, pp. 3966-3975, 2018. (113) A. Liavas, G. Kostoulas, G. Lourakis, K. Huang, and N.D. Sidiropoulos, “Nesterov-based Alternating Optimization for Nonnegative Tensor Factorization: Algorithm and Parallel Implementations,” IEEE Trans. on Signal Processing, vol. 66, no. 4, pp. 944-953, 2018. (111) B. Yang, X. Fu, and N.D. Sidiropoulos, “Learning From Hidden Traits: Joint Factor Analysis and Latent Clustering,” IEEE Trans. on Signal Processing, vol. 65, no. 1, pp. 256–269, Jan. 2017. (109) K. Huang, Y. Eldar, and N.D. Sidiropoulos, “Phase Retrieval from 1D Fourier Measurements: Convexity, Uniqueness, and Algorithms,” IEEE Trans. on Signal Processing, vol. 64, no. 23, pp. 6105–6117, Dec. 2016. (107) X. Fu, K. Huang, B. Yang, W.-K. Ma, and N.D. Sidiropoulos, “Robust Volume Minimization-Based Matrix Factorization for Remote Sensing and Document Clustering,” IEEE Trans. on Signal Processing, vol. 64, no. 23, pp. 6254–6268, Dec. 2016. (89) E.E. Papalexakis, T. Mitchell, N.D. Sidiropoulos, C. Faloutsos, P.P. Talukdar, B. Murphy, “Turbo-SMT: Parallel Coupled Sparse Matrix-Tensor Factorizations and Applications”, Statistical Analysis and Data Mining (SAM) journal, ’Best of SDM 2014’ special issue, to appear. N.D. Sidiropoulos ``Machine learning for communications", keynote speech at the 20th IEEE International Workshop on Signal Processing Advances in Wireless Communications (SPAWC), July 2-5, 2019, Cannes, France. N.D. Sidiropoulos (joint work with N. Kargas, X. Fu) ``Tensors and Probability: an Intriguing Union", distinguished symposium talk at GlobalSIP 2018: Tensor Methods for Signal Processing and Machine Learning Symposium, Nov. 28, Anaheim, California, USA. N.D. Sidiropoulos (joint work with N. Kargas) ``Tensors and Probability: an Intriguing Union", in Seventh IEEE Int. Workshop on Computational Advances in Multi-sensor Adaptive Processing (CAMSAP 2017), Dec. 10-13, Curacao, Dutch Antilles. N.D. Sidiropoulos, L. De Lathauwer, X. Fu, and E.E. Papalexakis, ``Tensor Decomposition for Signal Processing and Machine Learning", IEEE ICASSP 2017 tutorial, March 5-9, 2017, New Orleans, USA. Perspective”, IEEE ISSPIT 2003 tutorial, Dec. 14, 2003, Darmstadt, Germany. IEEE Signal Processing Society 2001 best paper award, for the paper “Parallel Factor Analysis in Sensor Array Processing”, by N.D. Sidiropoulos, R. Bro, and G. Giannakis, published in the IEEE Trans. on Signal Processing, August 2000. IEEE Signal Processing Society 2007 best paper award, for the paper “On Downlink Beamforming with Greedy User Selection: Performance Analysis and a Simple New Algorithm”, by G. Dimic and N.D. Sidiropoulos, published in the IEEE Trans. on Signal Processing, Oct. 2005. · IEEE Signal Processing Society 2011 best paper award, for the paper “Transmit Beamforming for Physical Layer Multicasting”, by N.D. Sidiropoulos, T.N. Davidson, and Z.-Q. Luo, published in IEEE Trans. on Signal Processing, June 2006. Distinguished Lecturer of the IEEE Signal Processing Society for 2008-2009. Fellow, IEEE, for contributions to Signal Processing for Communications, Nov. 2008. 2010 IEEE Signal Processing Society Meritorious Service Award “for dedicated service and leadership in the field of signal processing for communications and networking”. 2013 Distinguished Alumni Award, Dept. ECE, University of Maryland, College Park. Fellow of the European Association for Signal Processing (EURASIP) for contributions to tensor decomposition and signal processing for communications (2014). Appointed ADC Chair in Digital Technology, Jan. 2015. Appointed Louis T. Rader Professor, Aug. 2018. · Collaborative Research: Multimodal Sensing and Analytics at Scale: Algorithms and Applications, NSF ECCS-1807660, N.D. Sidiropoulos (collaborative project with X. Fu, Oregon State University). · Identifying Potential Investors using Joint Factorization and Latent Clustering, Corning, PI: N.D. Sidiropoulos; Co-PI: K. Huang. · III: Medium: High-Performance Factorization Tools for Constrained and Hidden Tensor Models, NSF IIS-1704074, PI: G. Karypis, co-PI: N.D. Sidiropoulos. · Oct. 2016: Received gift funding from Huawei Inc. to support our group’s 5G wireless research. · Robust and Scalable Volume Minimization-based Matrix Factorization for Sensing and Clustering”, NSF ECCS-1608961, PI: N.D. Sidiropoulos; Co-PI: X. Fu. · CIF: Small: Feasible Point Pursuit for Non-convex QCQPs: Algorithms and Signal Processing Applications”, NSF CIF-1525194, PI: N.D. Sidiropoulos. This is a collaborative project with SUNY-Buffalo (K. Slavakis). · BIGDATA: IA: DKA: Collaborative Research: Learning Data Analytics: Providing Actionable Insights to Increase College Student Success, NSF IIS-1447788, PI: G. Karypis, co-PI: N.D. Sidiropoulos. This is a collaborative project with GMU. 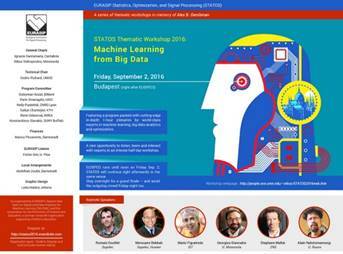 · Workshop on Big Data: From Signal Processing to Systems Engineering, NSF ECCS-1327148, PI and Chair: N.D. Sidiropoulos. Held at Arlington, Virginia, March 21-22, 2013. · Wideband cognitive sensing from a few bits, NSF ECCS-1231504, PI: N.D. Sidiropoulos. · EARS: Spectral Tweets: A Community Paradigm for Spatio-temporal Cognitive Sensing and Access, NSF AST-1247885, PI: N.D. Sidiropoulos, co-PIs: G.B. Giannakis, and J.D. Haupt. · BIGDATA: Mid-Scale: DA: Collaborative Research: Big Tensor Mining: Theory, Scalable Algorithms and Applications, NSF IIS-1247632, PI: N.D. Sidiropoulos, co-PI: G. Karypis. This is a collaborative project with CMU (PI: C. Faloutsos, co-PI: T. Mitchell, NSF IIS-1247489). · Sparse Latent Factor Models for Social Network Analysis and Tensor Completion, ARO/STIR W911NF-11-1-0500, PI: N.D. Sidiropoulos (9/15/2011 - 6/15/2012). Vice President, IEEE Signal Processing Society (2017-2019), responsible for membership activities. Guest co-Editor of Special Issue on Convex Optimization in Signal Processing, IEEE Signal Processing Magazine, May 2010. Signal Processing for Communications Technical Committee (SPCOM-TC), IEEE Signal Processing Society (2000 – 2008). Sensor Array and Multichannel processing Technical Committee (SAM-TC), IEEE Signal Processing Society (2004 – 2009). Tao Li, Ph.D. (UVA) May 2000, “Blind Signal Separation Using Batch and Adaptive Multilinear Regression”. Member of Technical Staff, Philips Wireless, San Jose, CA, 2000-2006. Senior system architect, ApaceWave, Fremont, CA (2007-). Xiangqian Liu, M.Sc. December 1999 (UVA), Ph.D. July 2002 (UMN), “Multidimensional Low Rank and Harmonic Analysis with Applications in Spread Spectrum Communications”. Assistant Professor at the University of Louisville, KY, 2002-2007; Associate Professor, University of Louisville, KY (2008); Staff Scientist, Broadcom, Atlanta (2009-). Tao Jiang, Ph.D. August 2003 (UMN), “Low-Rank Decomposition of Multi-Way Arrays with Applications in Signal Processing and Wireless Communications”. Post-Doctoral Researcher in Prof. Ottersten’s group at KTH, Sweden, Aug. 2004 - Mar. 2005; Mathematical Analyst, Bear Stearns, London U.K. & Tokyo, Japan, Apr. 2005 - May 2008; June - October 2008, Analyst at JP Morgan, Tokyo; Nov. 2008 - Oct. 2013, Senior Analyst with the Royal Bank of Scotland, Hong Kong; Nov. 2013 -, Senior Analyst with Macquarie, Hong Kong. Rama Budampati, M.Sc. December 2001 (UMN), “Khatri-Rao Space-Time Codes”. Engineering Manager at Honeywell, Minneapolis, where he has been on the technical staff since 2003. Georgios Latsoudas, M.Sc. August 2006 (TUC), “Multidimensional Scaling Approach for Node Localization in Wireless Sensor Networks”. Member of Technical Staff at Wind Cellular, Athens-Greece. Kleanthis Mokios, M.Sc. August 2006 (TUC), “Blind Speech Separation Using PARAFAC Analysis’’. Kleanthis started his own business, working on software for location-aware applications. He now works as a software engineer at OTS SA. Evaggelia Matskani, M.Sc. July 2007 (TUC), “Convex Approximation Techniques for Joint Multiuser Downlink Beamforming and Admission Control”. Ph.D. June 2012 (TUC), “Joint Resource Allocation and Routing in Wireless Networks via Convex Approximation Techniques”. Researcher at CERTH, Thessaloniki, Greece (Sep. 2012 -). Alexandros Valyrakis, M.Sc., Oct. 2007 (TUC), “Stochastic Modeling and Particle Filtering for Frequency Hopping”. Officer in the Greek Air Force Corps of Engineers. Eleftherios (Lefteris) Karipidis, Ph.D. Aug. 2008 (TUC), “Transmit Beamforming to Multiple Co-channel Multicast Groups”. Postdoctoral researcher, then Assistant Professor at Linkoping University, Sweden (2008-2013). Senior researcher at Ericsson Research, Stockholm, Sweden, (June 2013-). Dimitrios Evangelinakis, M.Sc. July 2010 (TUC), “Joint Admission and Power Control Using Branch & Bound and Gradual Admissions”. Member of technical staff at Nokia - Siemens R&D Center, Athens, Greece (Sep. 2010). Ioannis Mitliagkas, M.Sc. July 2010 (TUC), “Joint Power and Admission Control for Ad-hoc and Cognitive Underlay Networks: Convex Approximation and Distributed Implementation”. Ioannis earned his Ph.D. at UT Austin, and is now an Assistant Professor at the University of Montreal. Evangelos Papalexakis, M.Sc. July 2011 (TUC), “Co-clustering as multilinear decomposition with sparse latent factors”. Currently Assistant Professor at UC Riverside. Thimios Tsakonas, Diploma Thesis 2008 (TUC), “Tracking a time-varying harmonic using particle filtering”. Thimios earned his Ph.D. at KTH, Sweden (Sep. 2014). He is currently working as a data scientist at Elsevier, Amsterdam. Vassilis Ntranos, Diploma Thesis 2009 (TUC), “Multicast beamforming for minimum outage”. Vassilis earned his Ph.D. at USC, and is now a postdoctoral associate at Berkeley. Omar Mehanna, Ph.D. 2014 (UMN), “Frugal Sensing and estimation over Wireless Networks’’. Currently at Qualcomm, Inc.
Artem Mosesov, M.Sc. 2014 (UMN), “Adaptive Non-negative Least Squares with Applications to Non-Negative Matrix Factorization”. Currently at St. Jude Medical. Balasubramanian Gopalakrishnan, PhD. 2015 (UMN), “High Performance Adaptive Transmit Beamforming for Wireless Networks using Binary CSIT”. Currently at Qualcomm, Inc.
John Tranter, M.Sc. 2016 (UMN), ``Fast Unit-modulus Least Squares’’. John is Professor of Music at UMN, a highly sought-after trombone performer, and a senior engineer / data analyst / machine learning guru at St. Jude Medical. Kejun Huang, Ph.D. Aug. 2016 (UMN), ``Constrained Matrix and Tensor Factorizations: Theory, Algorithms, and Applications". After a two-year postdoc in our group at UMN, Kejun is now Assistant Professor in the Computer Science Department, University of Florida, Gainesville. Aritra Konar, Ph.D. Sep. 2017 (UMN), ``Non-convex QCQP: Hidden Convexity, Scalable Approximation and Applications". Post-doctoral researcher in Sidiropoulos' group at UVA (10/2017--). Dimitri Nion (2007-2008). Dimitri spent a year at TUC, working on adaptive algorithms for PARAFAC decomposition, blind speech separation, and MIMO radar, funded by the French DGA. After TUC, he joined K.U. Leuven, Kortrijk, Belgium. He now works for Bombardier in France. Niranjay Ravindran (2013-2014). Niranjay worked on parallel algorithms for sparse tensor compression and factorization. He is now with Hitachi Global Storage Technologies in Rochester, MN. Xiao Fu (2013-). Xiao first came to UMN as a visiting senior Ph.D. student from the Chinese University of Hong Kong, where he worked under the supervision of Prof. Ken Ma. In the fall of 2014, he re-joined as a Post-Doc. In Aug. 2017, Xiao joined Oregon State University as Assistant Professor in the Electrical Engineering and Computer Science Department. Cheng Qian first joined as a visiting PhD student in the fall of 2014 for a two-year stay. He re-joined as a postdoc in the Spring of 2017, and has been with the group since. Mikael Sorensen joined our group as a Research Scientist in May 2017.